The architectural style of the Belle Époque often borrowed elements of historical styles, ranging from neo-Moorish Palais du Trocadéro, to the neo-Renaissance style of the new Hôtel de Ville, to the exuberant reinvention of French 17th and 18th century classicism in the Grand Palais and Petit Palais, the new building of the Sorbonne. The new railroad stations, office buildings and department stores often had classical facades which concealed resolutely modern interiors, built with iron frames, winding staircases, and large glass domes and skylights made possible by the new engineering techniques and materials of the period. The Art Nouveau became the most famous style of the Belle Époque, particularly associated with the Paris Metro station entrances designed by Hector Guimard, and with a handful of other buildings, including Guimard's Castel Béranger (1898) at 14 rue La Fontaine, in the 16th arrondissement, and the ceramic-sculpture covered house by architect Jules Lavirotte at 29 Avenue Rapp (7th arrondissement). The enthusiasm for Art Nouveau did not last long; in 1904 the Guimard Metro entrance at Place de l'Opera it was replaced by a more classical entrance. Beginning in 1912, all the Guimard metro entrances were replaced with functional entrances without decoration. The most famous church of the period was the Basilica of Sacré-Coeur, built over the entire span of the Belle Epoque, between 1874 and 1913, but not consecrated until 1919. It was modeled after Romanesque and Byzantine cathedrals of the early Middle Ages. The first church in Paris to be constructed of reinforced concrete was Saint-Jean-de-Montmartre, at 19 rue des Abbesses at the foot of Montmartre. The architect was Anatole de Baudot, a student of Viollet-le-Duc. The nature of the revolution was not evident, because Baudot faced the concrete with brick and ceramic tiles in a colorful Art nouveau style, with stained glass windows in the same style. A new style, Art Deco, appeared at the end of the Belle Époque and succeeded Art Nouveau as the dominant architectural tradition in the 1920s. Usually built of reinforced concrete in rectangular forms, crisp straight lines, with sculptural detail applied to the outside rather than as part of the structure, it drew from classical models and stressed functionality. 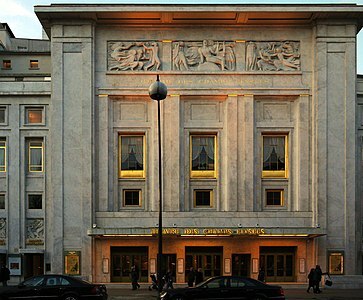 The Théâtre des Champs-Élysées (1913), designed by Auguste Perret, was the first Paris building utilizing Art Deco. Other innovative buildings in the new style were built by Henri Sauvage, using reinforced concrete covered with ceramic tile and step-like structures to create terraces. By the 1920s, it had become the dominant style in Paris. The Palace of Industry from the 1878 Exposition. New technologies displayed inside included Alexander Graham Bell's telephone and Thomas Edison's phonograph. The Trocadero Palace, built in a neo-Moorish or neo-Byzantine style for the Universal Exposition of 1878, was also used in the Expositions of 1889 and 1900. The Gallery of Machines of the 1889 Exposition. It was the largest covered space in the world when it was built. Three great international expositions were held in Paris during the Belle Époque, designed to showcase modern technologies, industries and the arts. They attracted millions of visitors from around the world, and influenced architecture far outside France. The first, the Paris Universal Exposition of 1878, occupied the Champ-de-Mars, the hill of Chaillot on the other side of the Seine, and the esplanade of the Invalides. The central building, the Palais de Trocadero, was constructed in a picturesque neo-Moorish or neo-Byzantine style by architect Gabriel Davioud, whose other notable works, built for Napoleon III, included the two theaters on the Place du Chatelet and the Fontaine Saint-Michel. The palace was used in all three Expositions of the Belle Époque, but was finally demolished in 1936 to make room for the modern Palace of Chaillot. The Paris Universal Exposition of 1889, celebrating the centenary of the French Revolution, was much larger than the 1878 Exposition, and gave Paris two revolutionary new structures; The Eiffel Tower was the tallest structure in the world, and became the symbol of the Exposition. The tower brought lasting fame to its constructor, Gustave Eiffel. The architects of the tower, including Stephen Sauvestre, who designed the graceful curving arches of the base, the glass observation platform on the second level and the cupola at the top, remain nearly unknown. An equally significant building constructed for the fair was the Galerie des machines, designed by architect Ferdinand Dutert and engineer Victor Contamin. It was located at the opposite end of Champ-de-Mars from the Eiffel Tower. It was reused at the exposition of 1900 and then destroyed in 1910. At 111 meters, the Galerie (or "Machinery Hall") spanned the longest interior space in the world at the time, using a system of hinged arches (like a series of bridge spans placed not end-to-end but parallel) made of iron. It was used again in the 1900 Exposition. When the 1900 Exposition ended, the French government offered to move the structure to the edge of Paris, but the city government chose to demolish it in order to resell the building materials. It was torn down in 1909. The Grand Palais (1900) had a neoclassical facade concealing a cathedral-like glass and iron exhibit hall. The 1900 Exposition was the largest and most successful of them all, occupying most of the space along the Seine from the Champs-de-Mars and Trocadero to the Place de la Concorde. The Grand Palais, the largest exhibition hall, was designed by architect Henri Deglane, assisted by Albert Louvet. Deglane had been an assistant to Dufert, the builder of the Palace of Machines. The new building contained an enormous gallery, whose arches converged to create a monumental glass dome. Though its visible iron framework made it appear very revolutionary and modern, much of its iron work purely decorative; the gothic iron columns which seemed to support the dome did not carry any weight; the weight was actually distributed to reinforced columns hidden behind the balconies. The facade was massive and neoclassical, with towering rows of columns supporting two sculptural ensembles. It served both to give a strong vertical element to balance the great width of the building, and to conceal the glass and steel structure behind. It was also designed to be in harmony with the historic buildings nearby, including the buildings around the Place de la Concorde and the 17th century church of Les Invalides on the other side of the Seine. The facade was greatly admired and widely imitated; a similar facade was given to the New York Public Library in 1911. The Hotel de Choudens, (1901), a neo-Renaissance mansion by Charles Girault, designer of the Petit Palais. In 1904, the architect Auguste Perret used reinforced concrete to create a revolutionary new building at 25 bis on Rue Franklin in the 16th arrondissement. Reinforced concrete had been used before in Paris, usually to imitate stone. Perret was among the first to take full advantage of the new architectural forms it could make. The building was on a small site, but offered an exceptional view of Paris. To maximize the view, Perret built the house of with large windows framed with ceramic decorative plaques made by Alexandre Bigot, mounted on reinforced concreter, so that facade of the building was almost entirely windows. The plaques were of a neutral color, to give the appearance of stone. By adding an excèdre on the facade, he was able to create five apartments on each floor, each with the view, whereas a flat traditional facade would have had only four. The architect Paul Guadet (1873–1931) was another pioneer in the use of reinforced concrete. He was the architect of several telephone exchanges for the Ministry of the Post Office, remarkable for their clean lines and modern appearance. The Post Office was his employer from 1912 until his death. The facade of his own house, at 95 boulevard Murat in the 16th arrondissement, is remarkably modern; it is almost all windows, framed by concrete columns, discreetly decorated with colored ceramic tiles. The Hôtel de Choudens, at 21 Rue Blanche in the 9th arrondissement, was another neoclassical house, designed by Charles Girault (1851–1932), who had won the Prix de Rome and who had won fame designing the Petit Palais for the 1900 Exposition. It was built for Paul de Choudens, a writer of librettos and musical editor. In addition to the traditional reception rooms, the ground floor included a room designed for musical auditions. It was inspired largely by the houses of the Italian Renaissance, but Girault added modern touches in the curving windows, the floral wrought-iron decoration, and a series of terraces in the rear facing the garden. The art-nouveau cupola of Galeries Lafayette (1912) provides natural light to the levels around the courtyard below. The modern department store was born in Paris in 1852, shortly before the Belle Époque, when Aristide Boucicaut enlarged a medium-sized variety store called Au Bon Marché, using innovative new means of marketing and pricing, including a mail order catalog and seasonal sales. When Boucicaut took charge of the store in 1852, it had an income of 500,000 francs and twelve employees. Twenty years later it had 1,825 employees and an income of more than 20 million francs. In 1869 Boucicault began constructing a much larger store, with an iron frame, a central courtyard covered with a glass skylight, on the rue de Sèvres. The architect was Louis Boileau, who received some assistance from the engineering firm of Gustave Eiffel. After more enlargements and modifications, the building was finished in 1887, and became the prototype for other department stores in Paris and around the world. The new office buildings of the Belle Époque often made use of steel, plate glass, elevators and other new architectural technologies, but they were hidden inside sober neoclassical stone facades, and the buildings matched the height of the other buildings on Haussmann's boulevards. The Saint-Gobain glass company built a new headquarters on Place des Saussaies in the 8th arrondissement in the 1890s. Since the firm had been founded under Louis XIV in 1665, the facade of the building, designed by architect Paul Noël, was perfectly modern on the inside, but had architectural touches from the earlier century; colossal columns, a square dome, and beautifully detailed sculptural ornament. The headquarters of the bank Crédit lyonnais, built in 1883 on the boulevard des Italiens in 1883 by William Bouwens Van der Boijen, was classical on the outside, but inside one of the most modern buildings of its time, using an iron frame and glass skylight to provide ample light to large hall where the title deeds were held. In 1907 the building was updated with a new entrance at 15 rue du Quatre-Septembre, designed by Victor Laloux, who also designed the Gare d'Orsay, now the Musée d'Orsay The new entrance featured a striking rotunda with a glass dome over a floor of glass bricks, which allowed the daylight to illuminate the level below, and the three other levels below. The entrance was badly damaged by a fire in 1996; the rotunda was restored, but the only a few elements still remain of the titles hall. Panorama of the Grand Amphitheater, decorated with murals of the history of the university. One of the most prestigious building projects of the Belle Époque was the reconstruction of a new building for the Sorbonne, replacing the crumbling and overcrowded buildings of the old university, while preserving the spirit and tradition of the architecture of the 17th century. The competition in 1882 was won by a little-known architect, Henri-Paul Nénot, who was only twenty-nine years old. He was a graduate of the École des Beaux-Arts, and had worked for various architects, including Charles Garnier. The principal feature of the building is the Grand Amphitheater, at 47 rue des Écoles. Nénot placed the most striking features of the building in the interior, in the vestibule with its great arches and its two symmetrical stairways leading to the balconies and to the grand hall of the Council of the University, placed under a cupola completely open up to the second floor. He gave great attention to the secondary spaces, not just the main rooms, and to the different perspectives created as visitors climbed the stairways. A starkly modern skylight fills the amphitheater with light. The openness of the interior architecture also illuminates and highlights the murals which illustrate the history of the university. The first part of the project was carried out in the 1880s. The second part, in the 1890s, was creating new facades and an arcade around the great courtyard at 17 rue de la Sorbonne, which looked out on the chapel. Nénot preserved some of the motifs of the old buildings, and a few original architectural features, such as the large sundial which decorated the facade central building on the courtyard. The facades were simplified and given a greater clarity and harmony, while preserving the essential spirit of the 17th century architecture. The Salle Saint-Jacques, the reading room of the Sorbonne library, with its arched ceiling and walls decorated in the pure Beaux-arts style, was completed in 1897. Later in the period, at the end of the 20th century, some architects tried to develop a new forms and a new aesthetic, using modern materials. The best example was the Église Saint-Jean-de-Montmartre, begun in 1894 by architect Anatole de Baudot. Baudot was an expert in medieval architecture, and was a pupil of Viollet-le-Duc. He was professor at the École de Chaillot, which trained the architects in the restoration of historical monuments, as well as professor of medieval architecture at the École des Beaux-Arts. In his project for the new church, he combined the gothic with the Art Nouveau. He commissioned some of the major artists of the Art Nouveau, including ceramics artist Alexandre Bigot, ironwork craftsman Émile Robert, and sculptor Pierre Roche. It was the first church in Paris to be built of reinforced concrete, and Some features, particularly the facades of the sides, were highly original. The result was a curious combination of the gothic and modernism. The leading figure of modernist architecture in the 1920s, Corbusier, was particularly outraged by the church and described it as "hideous". Another original design was that of the Église-de-Notre-Dame-du-Travail in the 14th arrondissement, by architect Jules Astruc, built between 1897 and 1902. It replaced a smaller church in the parish, and was designed for the large numbers of construction workers who had come to Paris to work on the 1900 Exposition and who settled in the neighborhood. While the exterior of the church is a simple and unadorned Romanesque style, the interior the iron framework was openly and dramatically on display. Facade of the Céramic Hôtel, covered with ceramic decoration and sculpture by Camille Alaphilippe. The Céramic Hôtel at 14 avenue de Waggram in the 8th arrondissement, was built in 1905 by the architect Jules Lavirotte, with sculpture by Camille Alaphilippe. Like the residential building designed by Lavirotte, the reinforced concrete facade is almost completely covered with decoration made by the ceramics studio of Alexandre Bigot. It won the municipal competition for best facade in 1905. The most prominent hotel built in the Art Nouveau style is the Hotel Lutetia, built in 1910 at 45 Boulevard Raspail. It was constructed by the owners of the Le Bon Marché department store, on the other side of Square Boucicault. It was originally built by the owners of the department store as a place to stay for the wealthy customers coming from out of town. The architect was Louis-Charles Boileau, who also enlarged the department store. The facade remains Art Nouveau, but the interior was remodeled later to Art Deco. Train Bleu Restaurant in the Gare de Lyon (1902). It looked out from the station facade on one side, and onto the train platform on the other. The restaurant Pré Catalan in the Bois de Boulogne (1905), like department stores of the period, had plate glass windows from floor to ceiling. Painting by Alexandre Gervex (1909). The architecture and decor of Paris restaurants closely followed the styles of the day. The most characteristic restaurant of the Belle Époque style still in existence is the Train Bleu restaurant, designed by Marius Toudoire as the station buffet when it opened in 1902. The lavishly decorated interior is in the style of the 1900 Exposition, the event for which the station was built. The light coming through the large arched windows out the facade on one side, and onto the platform from which trains depart on the other. The classic Art Nouveau style was used by architect Henri Sauvage in 1899 when he designed an intimate private dining room for the Café de Paris, The furnishings were designed in forms imitating nature, plants and flowers. The Café was demolished in 1950, and nothing remains but these furnishings, which are now on display in the Musée Carnavalet. The edicule of the Metro at Place de la Bastille, demolished in 1962.
the Metro edicule at Porte Dauphine is the only one still in its original place. In 1899 the company building the new Paris Metro system, the Compagnie du chemin de fer métropolitain de Paris (CMP), held a competition for the design of the new edicules, or station entrances, to be built around the city. The rules of the competition required that the new edicules "should not make ugly or impede the public way around the stations; on the contrary, they should amuse the eye and decorate the sidewalks." Guimard, considered the most audacious architect of the period, won the competition. The unique style of his stations made them easily recognizable from a distance, one of the important requirements of the competition. He designed a whole series of different variations, ranging from small and simple railing of a stairway to a large pavilion for the Place de la Bastille. Guimard's entrances, with their color, material and form, were in harmony with the stone buildings of the Paris streets, and even, with their vegetal curves, fit well with trees and gardens. They were not used in certain locations, such as place de l'Opera, where they would have looked out of place next to the enormous monuments. The design and construction of the entrances was done by another architect, Joseph Cassien-Bernard (1848–1926). The entrances were admired at first, but tastes changed, and in 1925 the entrance at the Place de la Concorde was demolished and replaced with a simpler, classical entrance. Gradually, almost all of the Guimard entrances were replaced. Today, there are only three original edicules. The edicule at Porte Dauphine is the only one still in its original place; the edicule at Abbesses was at the Hotel de Ville until 1974; and the edicule at Place du Châtelet was recreated in 2000 to celebrate the centenary of the Metro system. Gare de Lyon, by architect Marius Toudoire (1895–1902). Interior of the Gare d'Orsay (now the Musée d'Orsay) in about 1900. The main railroad stations of Paris predated the Belle Époque, but they were enlarged and lavishly decorated to impress the visitors to the Expositions of 1889 and 1900. The Gare Saint-Lazare featured a grand shelter for the trains forty meters high, built between 1851 and 1853 by Eugène Flachat, and memorably captured in the impressionist paintings of Claude Monet in 1877. It was enlarge and redecorated for the 1889 Exposition by Juste Lisch, who also designed the neighboring Hotel Terminus. The Gare du Nord, by architects Reynaud and Jacques Ignace Hittorff, was finished in 1866, but expanded in 1889 for the 1900 Exposition. The Gare de l'Est first built between 1847 and 1850, it was tripled in size between 1895 and 1899 to welcome Exposition visitors. The Gare Montparnasse, first built in 1840 on Avenue du Maine for the Paris-Versailles line, was moved to its present location between 1848 and 1852, and then enlarged and redecorated between 1898 abad 1900 for the 1900 Exposition. The Gare de Lyon, originally built for the line Paris-Monterau in 1847, was completely rebuilt between 1895 and 1902 by architect Marius Toudoire (1852–1922) and the engineering firm of Denis, Carthault and Bouvard. Unlike the earlier stations, which had traditional neoclassical facades attached to the modern structure of the train shed. Toudoire chose to give the Gare de Lyon a facade different from other public buildings; it had a series of monumental arches with doorways opening to arcades within the station. The spaces between the arches were decorated with sculpture. Above that level was an even more unusual element; a strong horizontal band of windows. The tower with an enormous clock was another unusual feature, unlike any other train station or historical model in the city. The interior features included a buffet later named the Train Bleu, in the most lavish Belle Époque style. The Gare d'Austerlitz, or Gare d'Orleans, was inaugurated in 1843 and enlarged between 1846 and 1852. In 1900 the same company decided to build a new station, the Gare d'Orsay, closer to the center of the city and to the Exposition. It was the first station designed to accommodate electric trains, and it was intended to contain a hotel as well as a train station; the hotel was placed where the museum entrance is today. The original design for the station called for a Renaissance style facade similar to that of Haussmann's buildings on the boulevards. The City of Paris wanted something more monumental to match the grandeur Louvre across the Seine, but also wanted it to clearly express its function as a train station. The city required that a competition be held, which was won by Victor Laloux. His winning design included a feature similar to the Gare de Lyon; he opened the side of the station facing the Seine with very high arches filled with windows, and facade above the windows was decorated with sculptures and emblems. The huge clock became an integral part of the facade. The new station was inaugurated on July 4, 1900, just in time for the Exposition. As a train station It was not a commercial success, and was planned for demolition in 1971, but was saved and between 1980 and 1986, it was transformed into a museum of 19th century French art, the Musée d'Orsay. Eight new bridges were built across the Seine between 1876 and 1905; the Pont Sully, (1876), to the Ile-Saint-Louis, replacing two footbridges from 1836; the Pont de Tolbiac (1882); the Pont Mirabeau in 1895; the Pont Alexandre-III (1900), built for the 1900 Exposition; the Pont de Grenelle-Passy (1900) for the railroad; the Passerelle Debilly, a footbridge connecting sites of the 1900 Exposition on the two banks; the Pont de Bir-Hakeim (1905), built which carried both pedestrians and a metro line; and the Viaduc d'Austerlitz, used by the Metro. The most elegant and famous of the Belle Époque bridges is the Pont Alexandre-III, designed by architects Joseph Cassien-Bernard and Gaston Cousin, and engineers Jean Résal and Amédée d'Alby. It was largely decorative, designed to connect the Grand Palais and Petit Palais of the Exposition on the right bank with the parts of the Exposition the left bank. The first stone was laid by Nicholas II of Russia, the future Czar, in October 1896. The bridge combined the modern engineering of a single iron span bridge 107 meters long with classical beaux-arts architecture. The counterweights supporting the bridge are four massive masonry columns, seventeen meters high, which serve as the bases for four works of beaux-arts sculpture, representing the four "Fames"; the Sciences, the Arts, Commerce, and Industry. In the center, the sides of the bridge are decorated with two groups of river nymphs; the Nymphs of the Seine on one side, the Nymphs of the Neva on the other. A similar bridge, the Trinity Bridge, designed by Gustave Eiffel, was built over the Neva River in the Russian Capital, St. Petersburg, beginning in 1897. Another architect at the end of the Belle Epoque whose work heralded the new art deco style was Henri Sauvage. In 1913 he constructed an apartment block at 26 rue Vavin in the 6th arrondissement, for a group of artists and decorators. The exterior was simple and geometric, completely covered with ceramic tiles. the most unusual feature of the buildings were the gradins; the upper floors were arranged like a stairway, which allowed residents on these floors to have terraces and gardens. The only decoration was the iron railings and geometric patterns created by mixing a few black tiles with the white tiles. .
^ Sarmant 2012, p. 202. ^ Marchand 1993, p. 169. ^ Plum 2014, p. 5. ^ Stamper, John, Studies in the History of Civil Engineering (2000), Volume 1. ^ Plum 2014, p. 14. ^ Plum 2014, p. 22. ^ Plum 2014, p. 115. ^ Lahor 2007, p. 139. ^ Plum 2014, p. 44. ^ Plum 2014, p. 88. ^ Plum 2014, p. 86. ^ Plum 2014, p. 20. ^ Plum 2014, p. 28. ^ Plum 2014, pp. 34–35. ^ Plum 2014, p. 24. ^ Plum 2014, p. 26. ^ Plum 1996, pp. 100–103. ^ "La bibliothèque de la nouvelle Sorbonne (1897 a now jours)" (in French). Bibliothéque Universitaire Sorbonne. Retrieved August 20, 2015. ^ Renault 2006, p. 106. ^ Plum 2014, p. 104. ^ "Église de Notre-Dame-du-Travail in the Merimee data base of historic monuments" (in French). French Ministry of Culture. Retrieved August 20, 2015. ^ Plum 2014, p. 132. ^ Plum 2014, pp. 30–31. ^ From Émile Rivoalen, Concours des edicules du metropolitan, in La Construction moderne, August 19, 1899. Cited in Plum, Paris - architectures de la Belle Époque, p. 126. ^ Plum 2014, pp. 122–23. ^ Fierro 1996, pp. 900–901. ^ Plum 2014, p. 120. ^ Fierro 1996, p. 900. ^ Fierro 1996, p. 1088. ^ "Alexandre III Bridge". Structurae—International Database for Civil and Structural Engineering. Wilhelm Ernst & Sohn Verlag. Retrieved 4 October 2014. ^ a b Plum 2014, p. 128. ^ Renault 2006, pp. 112–113. ^ Plum 2014, p. 136. ^ Plum 2014, p. 76.